Tomorrow my friend and I are flying north to Murun, then catching a ride to Tsaagannuur where we will stay with a girl I met only a week ago, who will then take us to visit her extended family, who just happen to be living in one of the most remote parts of Mongolia: the taiga. 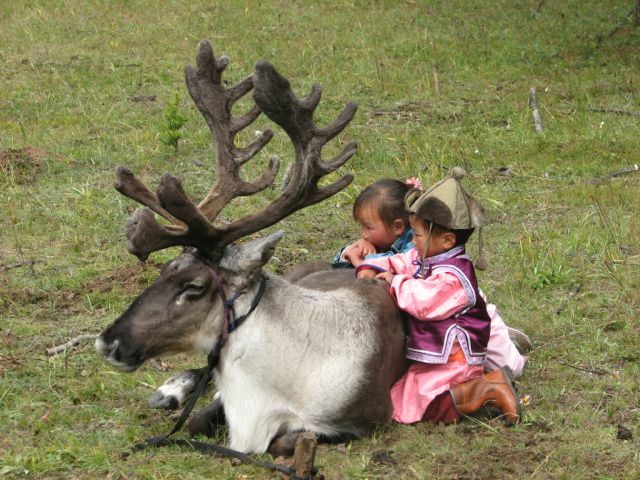 We are planning to visit the Tsaatan (Reindeer People) who live in Mongolia’s Khovsgol province, which borders Russia. We will be getting into the 4th set of 9 days by the time we reach the taiga, which means it’s going to be very, very cold. I’m still not sure if the feeling in the pit of my stomach is one of utter excitement or shear terror. Probably both. I’m hoping to capture some of the Tsaatan music and gain some understanding of how people can live so close to the elements in some of the harshest winter weather in the world. I first heard of the Reindeer People several years ago while working as an intern for Cultural Survival, an organization that works to promote the rights of indigenous peoples worldwide. Among their many activities was the Totem People’s Preservation Project, an effort to help the reindeer herders maintain their lifestyle. In preparation for my trip, I headed down to the nearby American Center for Mongolian Studies library which has several academic and research materials on Mongolia available for perusal. I found some helpful information from a series of studies conducted between 2002 and 2004 called The Deer Stone Project. ABC Nightline traveled to the region in 2009. Read the article here and see photos from the journey here. I’m pretty sure We have look at this very same type of statement elsewhere, it must be more popular using the world.